last night i watched the film another year by mike leigh which is a year in the life of a couple and the people who pass through their home and lives. the seasons are measured through the changes in their local allotment. i can't imagine for a moment the film doing well in another culture - it gets at aspects of englishness, a kind of englishness that is at times painful and awkward. this was one of the more interesting takes on the film i have read exploring how films represent single women (often badly or at least unfairly). it reminded me of the book watching the english which i have dipped in and out of for a while but finally got to read fully last week whilst in belgium. it's been around several years - i'm a bit slow. 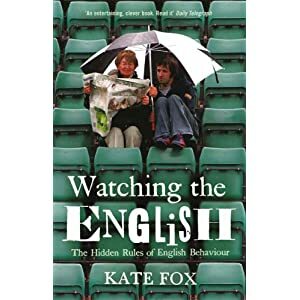 written by kate fox, who is herself english, it's an anthropologist turning her skills in reading cultures on home turf as it were. lots of friends who have come to live in england from other cultures find it incredibly helpful (and funny) as they try and make sense of a culture that seems like it should be straightforward but can be anything but. in mission, reading cultures is an absolutely central skill - anthropology and more latterly cultural studies are key partners along with missiology, theology, sociology and bundle of other disciplines. that's really why i picked up the book because part of the challenge in relation to reading cultures is that our own culture to us is just the way things are, it's invisible. befopre reading other cultures we have to heighten our own sense of being cultural creatures. and of course the invisibility of culture is why suggesting that church may not be working as it is because it's wedded to particular cultural expressions is still perceived as a threat. i really recommend the book, (though it's not short). kate fox comes up with a core - what she terms social dis-ease. this sounds very negative and probably is but it gets at that awkwardness and embarrassment that english people can have. this is writ large in the film especially in the final season winter! humour is the reflex that enables the english to cope with this awkwardness - humour nearly all the time in all situations. banter and irony are never far away. this reflex is also coupled with moderation - don't rock the boat too much, gradual change, let's be nice, anyone for a cup of tea?... and hypocrisy - we don't say what we think and people know it. it drives cultures where directness is a central value mad! on top of the reflexes she identifies 3 outlooks and 3 values - things like eeyoreishness and fairplay. she is particularly good at lifting the lid of the layers of class consciousness enshrined in speech, the cars we drive, and virtually every area of life. it's the detail and the nuances that are so billiant in her observations. the class is not about money - which i think can be a confusing thing in relation to some other cultures. it's about societal status and perception. it's a very enjoyable and at times painful read. if you are trying to make sense of the english it could be invaluable, but it's also a mirror that's worth looking into if you are english. and it's a great text for anyone teaching in the area of reading and crossing cultures.